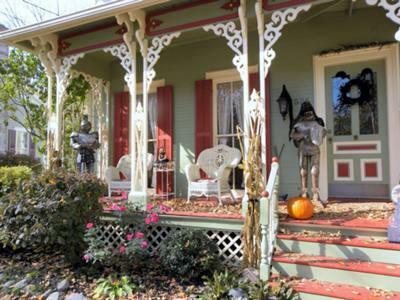 What better way to find Halloween decorating outdoor ideas than from uniquely decorated front porches? 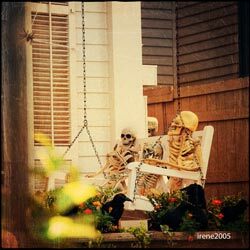 We appreciate that site visitors like yourself continue to send us wonderful pictures of outdoor Halloween decorations for you to enjoy. 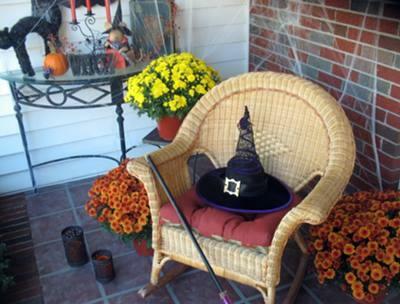 Halloween has become one of the most "outdoor decoration" seasons; it's a wonderful time of the year to enjoy the outdoors. 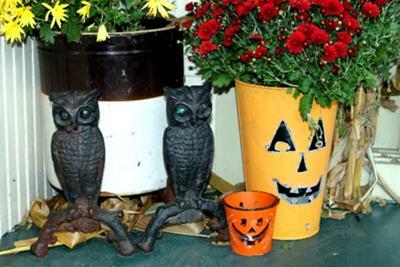 Autumn, Halloween,and decorations just go together. 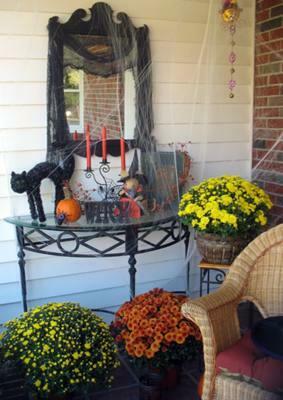 We know you'll find loads of Halloween decorating outdoor ideas and inspiration from our photo gallery. 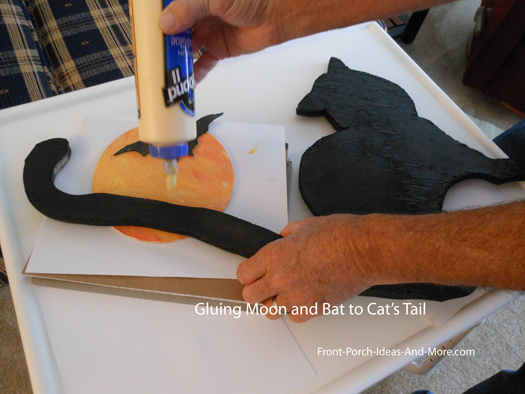 Make this Halloween black cat with moon and flying bat - free template and instructions below. A fun project for the whole family. 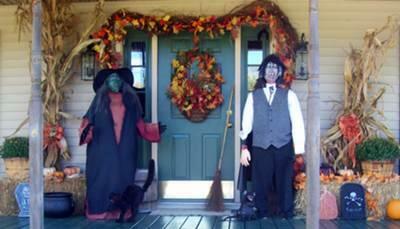 It is easy to do and will add some Halloween fun to any front porch or yard. 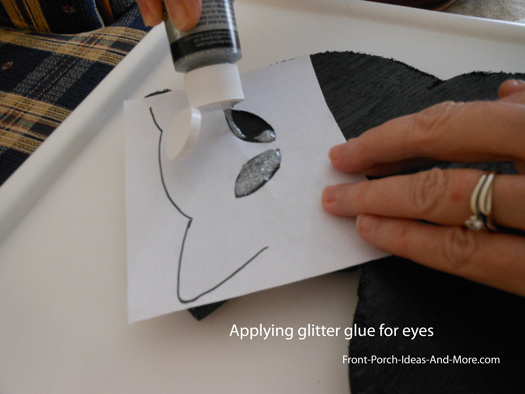 You can also make this as an indoor Halloween decoration too. 1. 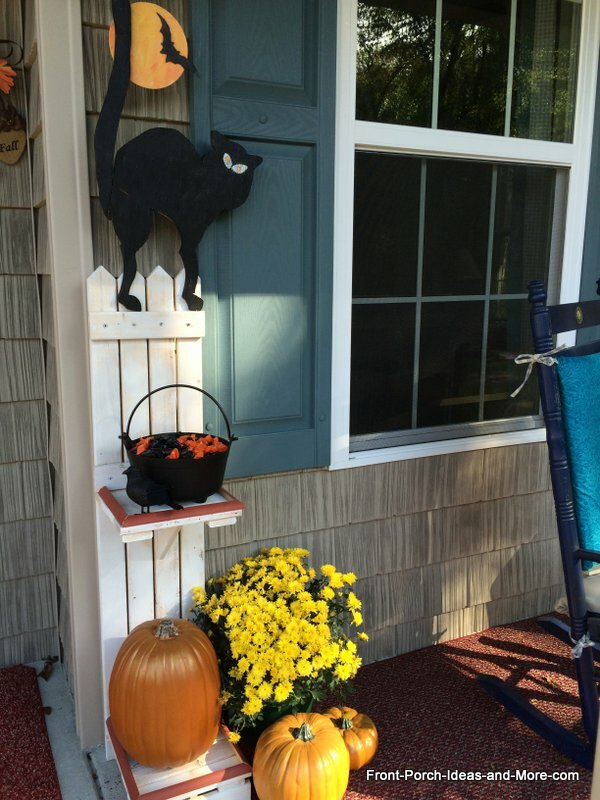 Use foam to create tombstones (check with your local dollar store for inexpensive autumn and Halloween craft items. 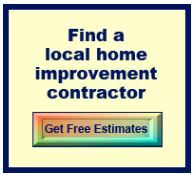 We've found them to be really inexpensive. 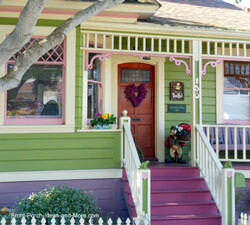 Use stone-like paints to give it an authentic look. 3. 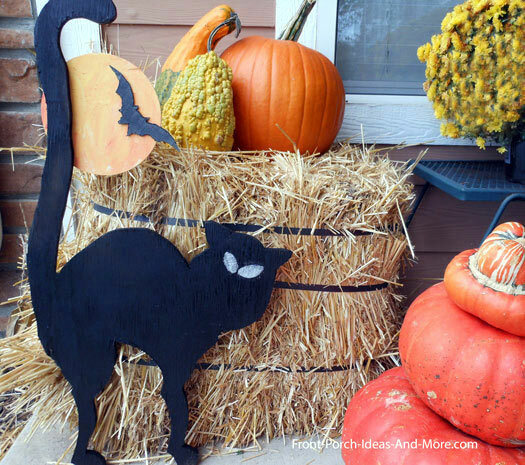 Make spooky signs out of scrap pieces of wood or foam (which can be painted). Hang with rope or cord. 4. 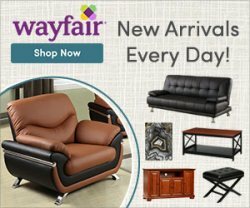 Create a coffin from heavy cardboard or plywood. Place a skeleton inside along with playing spooky music. 5. 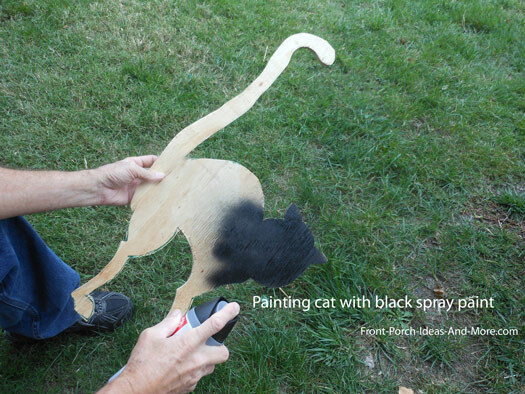 Use black spray paint to cover branches. 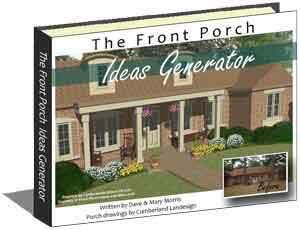 Place them in your graveyard or use them on your porch steps. 6. Make a maze of sheets (ghosts) on your porch. 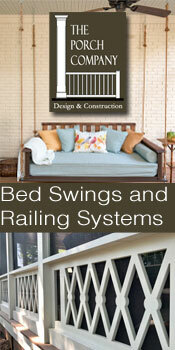 String lines across the topof the ceiling and hang sheets making it slightly difficult to navigate to the front door. 7. 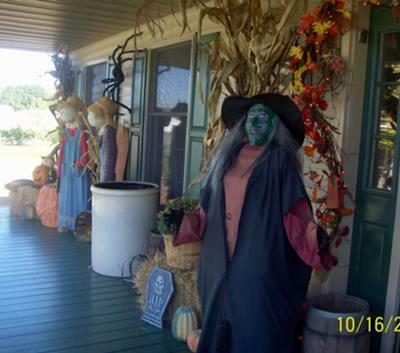 Make and place scarecrows on your porch. 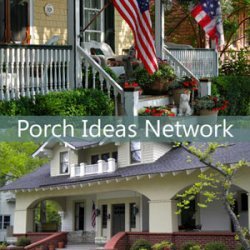 Use them to line the sides of porch steps. You can often find overalls and flannel shirts at Goodwill. 8. 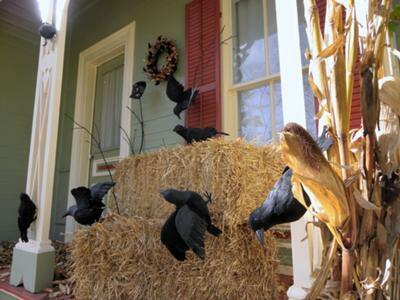 Use bales of straw to create a maze for the little ones. 9. Fill a wheelbarrow with dirt (or straw) and bury fake bones for the little ones to find. 10. 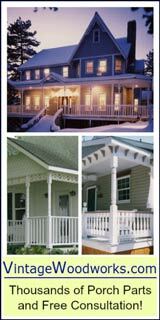 String a line across your porch ceiling and attach a skeleton so you can pull it across your porch. 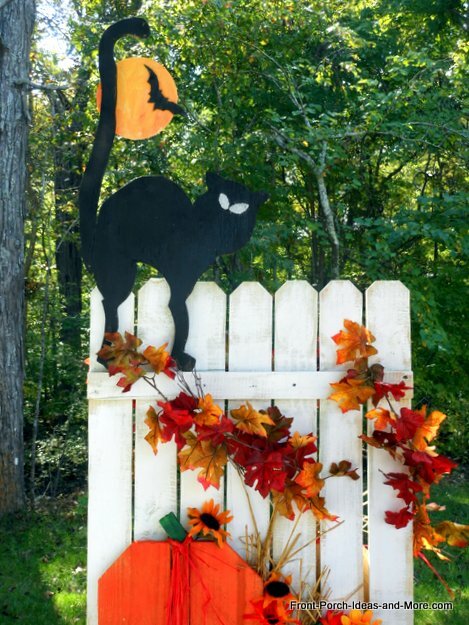 ...and one more Halloween decorating outdoor idea. It's all about the lighting. No matter your outdoor decorations make sure you experiment to find just the right lighting angles to make your scene pop. We provide you the template. 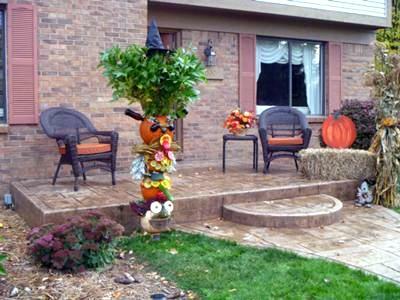 Speaking of Halloween decorating outdoor ideas, here's an easy and fun project for kids of all ages. 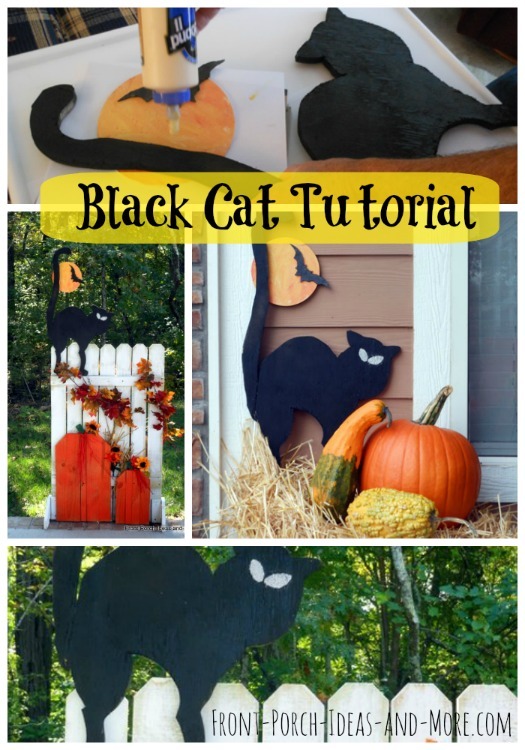 Make this Halloween black cat - perfect as a decorative item on your front porch or in your yard. Our cat is 28 1/2 inches tall by 15 1/2 inches wide. 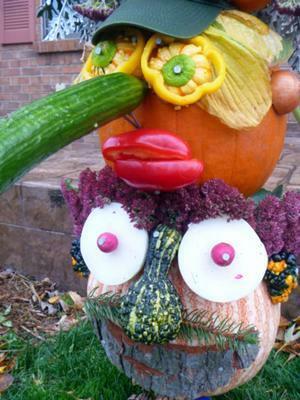 We put him on our autumn pumpkin fence and wow! So cool. 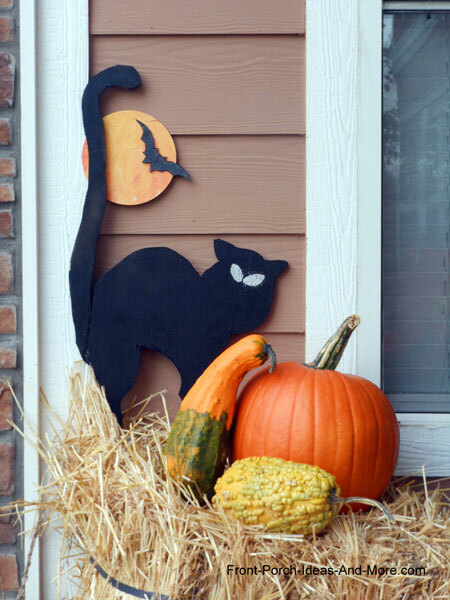 You could even make this out of construction paper or cardboard for an indoor Halloween decoration! 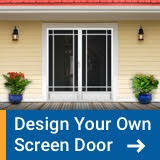 Although the template contains complete instructions, we've included them here also so you can see how easy it is to make. Wooden circle for the moon (available at Michaels or other craft stores). 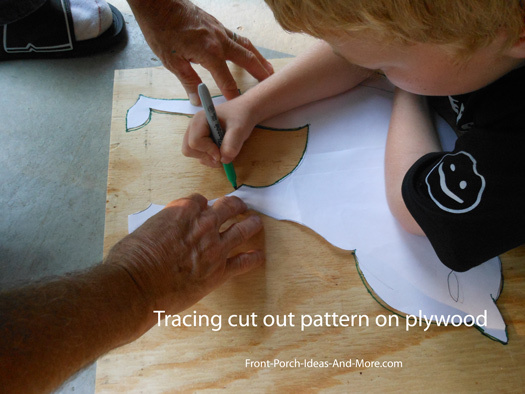 You can cut it from the same piece of plywood or even use a plastic round lid. Download our free template. Tape the template papers together as shown at right. Use the scissors to cut out the cat, moon, and bat. 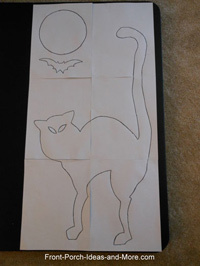 Lay the cutout of the cat, moon (if applicable), and bat on the plywood and trace around them with the pencil. 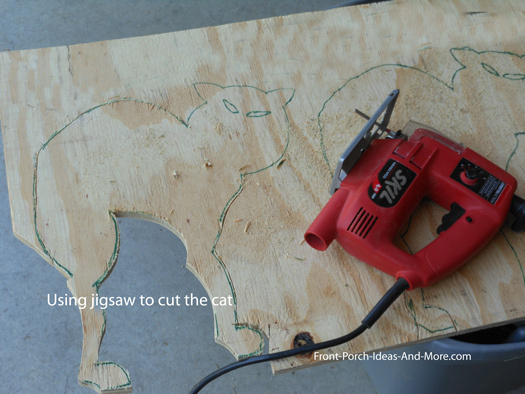 Use the jigsaw to cut out the cat, moon (if applicable), and bat. 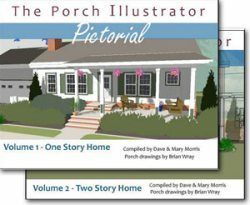 Place on front porch and enjoy! Don't run off just yet - we have so many more Halloween Decorating Outdoor Ideas for you! Often times it can be just the simplest decoration that adds lots of appeal. 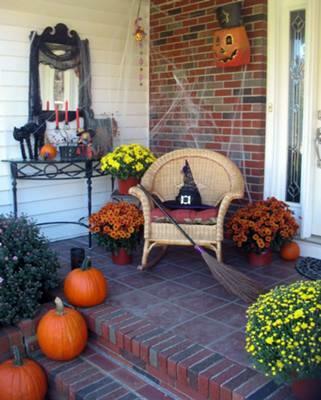 A hint of Halloween can be just as much fun as an elaborate display. 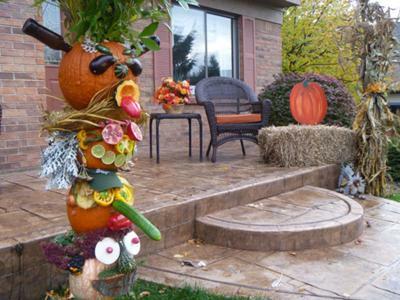 Carved pumpkins, decorating pumpkins, and pumpkin topiaries all make for a fun Halloween. 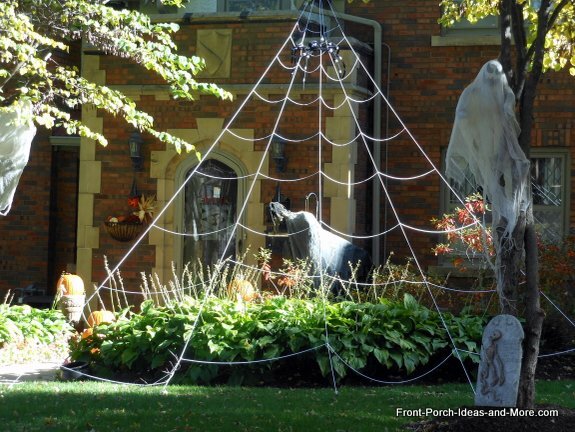 Check out this rather eerie spider web on this Halloween porch. 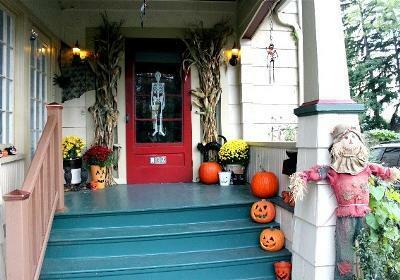 Do you enjoy decorating for the trick or treaters? 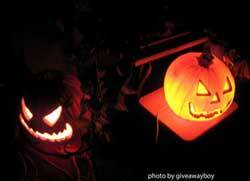 Do you like cute or spooky or frightening? 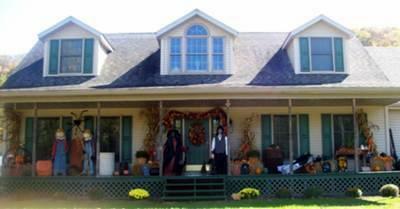 Pretty front porch decked out for Halloween. 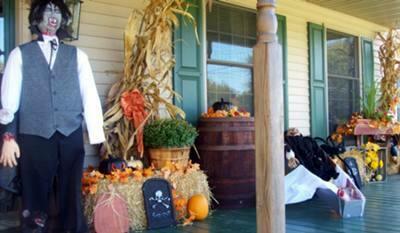 Carved pumpkins, corn stalks, scarecrows, and skeletons never seem to go out of holiday fashion. 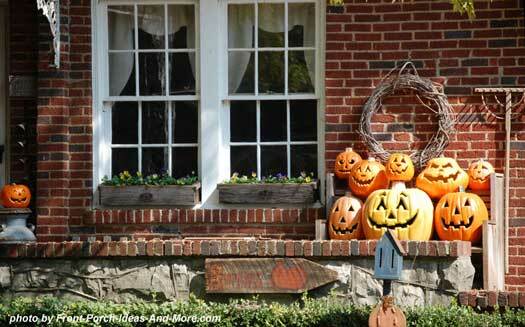 Looking for unique Halloween decorating outdoor ideas? 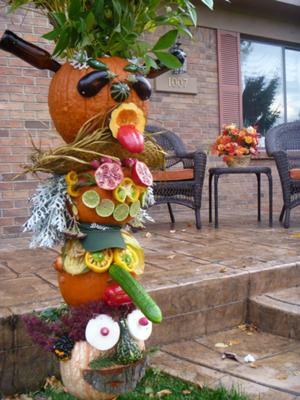 Try this pumpkin totem-pole that Joetta shared with us! Let your imagination run wild and create one of your own. Take a good look to see what was used to create this masterpiece. 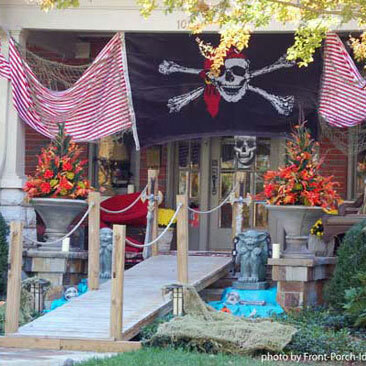 See how this family used their entire large porch to create a great Halloween experience. 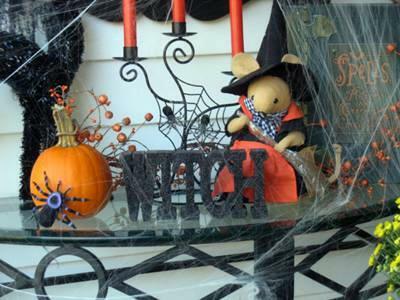 Use ideas from all or parts of this display on your own porch. Thanks to Donna of WV for sharing with us. 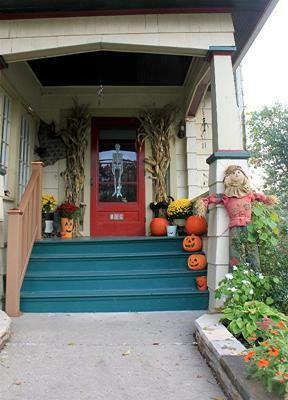 The ideas from this classy Halloween decorated porch would work well on any size front porch. The decorated mirror on the wall adds a real special touch and will reflect any light at night to create an eerie display. Our thanks to Barbara Curran for sharing with us. 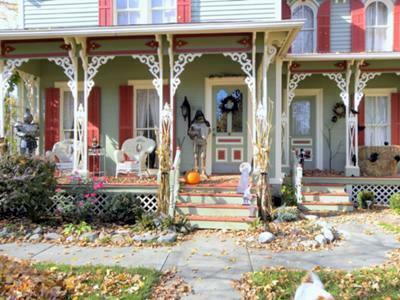 This Victorian front porch makes a statement even in the daytime; imagine walking up on this porch at night! Gotta love those crows. Put some sound with this scene and it could be real spooky! Thanks to Robin Martin for sharing this with us. 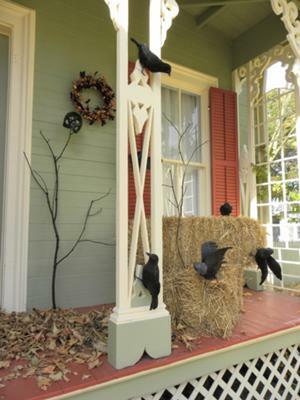 See how Kate decorates her porch for Halloween in vintage type…..